Do the photos or images files take up too much of your iPhone space? Are there a large number of songs storing on your iPhone? Want to backup your iPhone data to Mac PC before updating it to iOS 8? Looking for a easy way to manage your iPhone data on Mac? Wanna sync the previous backup file from Mac to iPhone, so as to restore the lost data? Whether you want to free up the storage space of your iPhone, backup your iPhone data or manage your iPhone on Mac, your just want a simple yet effective way which can save time and effort. Luckily, you come to the right place. iPhone to Mac Transfer is an all-in-one and user-friendly data transfer and managment software. 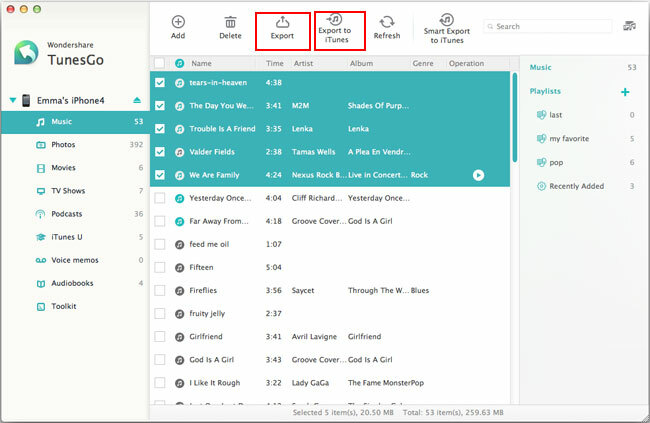 The program enable you one-click to transfer music, photos, videos, playlists and more from iPhone, iPad and iPod to iTunes or Mac, and easily manage all of them on Mac anytime and anywhere. In addition, you can also transfer data from iTunes and Mac back to iPhone by using this transfer software. Note: Before the transfer of your data, please make sure that iTunes has been installed on your Mac. After installation, run the iPhone to Mac Transfer on your Mac, then take out your Apple USB cable to connect your iPhone to Mac. The program will detect your device soon and show you your iPhone detail information in the window. 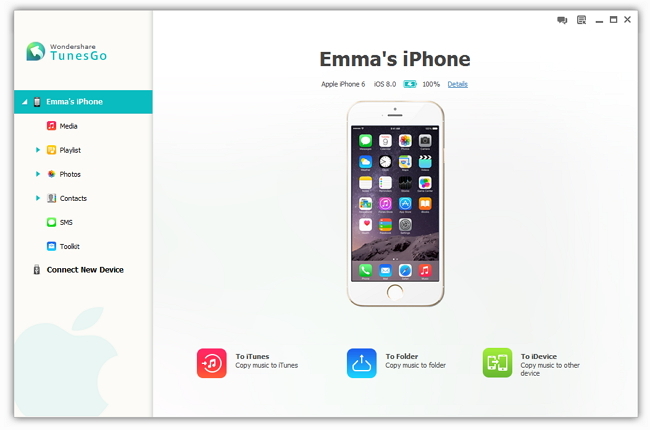 Once your iPhone is recognized, all the transferable data are displayed in the left column, including music, photos, movies, Audiobooks, Voice Memos, iTunes U, Podcasts, and so on. Tap the data you want in the left sidebar, and the detail contect will appear in the window on the right, previewing to check those what you want, clcik "Export" or "Export to iTunes" at the top menu to directly transfer them to your Mac or the iTunes library for backup. Note: In order to successful transfer all of your data, please keep your iPhone connected during the whole transfer process. In addition of iPhone to Mac Transfer, iPhone Data Recovery for Mac can also backup your existing or deleted data from iPhone to Mac with a click. 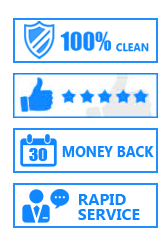 No matter you want to restore your lost data from iPhone, or transfer iPhone data from iPhone to Mac, it is definitely your first choice, one click to recover lost or deleted data including contacts, messages, media files and more from iPhone on Mac, and save the restored and existing data from iPhone to Mac.